MadgeTechs LNDS, Liquid Nitrogen Data Logging System, is an ultra-low temperature measurement system created specifically for the monitoring of temperature sensitive substances that need to be preserved at cryogenic temperatures. The LNDS can be mounted to the top or outer of a cryo-shipper or freezer, and the probe sheath can be inserted into the tank. The user can then directly view the internal temperature through the LCD on the logger. Also, a variety of probe sizes are available. MadgeTechs LNDS is easily user programmable with pre-selected sample rates from between 2 seconds to 24 hours, and it features a programmable start time and date, up to six months in advance. The 8-button membrane keypad and large LCD provides the user with the ability to view the current reading, minimum, maximum, and average statistics, in real-time. The nonvolatile memory will retain data even if AC and battery power are lost. Also, the 9-volt battery it runs on is both user-replaceable and cost effective. 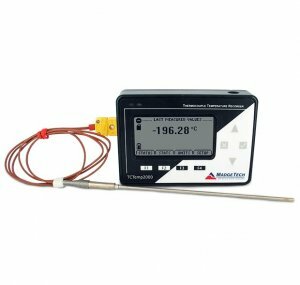 The Liquid Nitrogen Monitoring System includes the TCTemp2000 data logger with thermocouple probe, and 9 volt AC wall mounted power adapter.